I was 12 years old when I was introduced to Gandhi. My uncle Mubarak returned from India with four big heavy boxes filled with books. All same size and shape with warn-out green covers. These books included all the writings of Gandhi. They filled two book shelves, double the space taken by the Encyclopedia Britannica. What attracted me in the boxes was a comic book of the story of Gandhi from his childhood to his death. I read the comic book over and over. At a young age, Gandhi became a comic book hero. Gandhi became a real hero through the work of Mubarak, who started the Palestinian Center for the Study of Nonviolence in Jerusalem. Mubarak traveled from one Palestinian village to the other promoting nonviolence in the same way Gandhi did in India. As he spoke of Gandhi, he never said we need to do what Gandhi did; he emphasized the uniqueness of our own heritage, culture and condition under Israeli occupation and how we were to develop our own approaches to nonviolence and not copy others. In 1988 Mubarak Awad, who became known as the “Palestinian Gandhi,” was arrested and deported by the Israeli authorities. Over the years I continued to study Gandhi, reading more of the big green books that now sit on two shelves in my office in Bethlehem. I have also traveled to India twice. Once with Arun Gandhi, the grandson of the Mahatma, and the second to participate in a conference to commemorate the century celebration of one of Gandhi’s most famous writings, Hind Swaraj. There I was honored to give a talk in the presence of His Holiness the Dalia Lama. 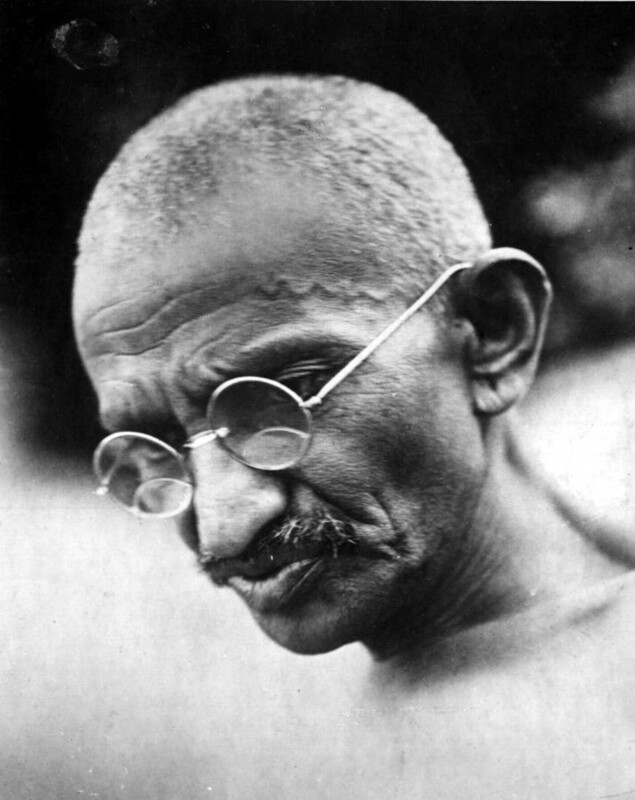 As a Palestinian, there are many lessons learned from Gandhi. One important lesson was in seeing nonviolence not only as a tactical and pragmatic tool of resistance but also as a holistic and spiritual approach to life and living. Gandhi was not only passionate about ending the British colonial rule of India, he was also passionate about uprooting the cause of violence in every aspect of one’s life and relations. This is not easy for people who live under daily suffering and oppression, but in my work in nonviolence in Palestine, I now believe that my own liberation as a Palestinian is not only about ending the Israeli military occupation, but also about addressing all aspects of violence — be they political, social, economic or environmental. Nonviolence is not a tactic to be taken out of the box when it seems fit to use. It is a way of life. Nonviolence is about creating tension, confrontation and standing for ones justice by exposing the injustice of the other. Gandhi called for mass protests, demonstrations and boycotts. He challenged directly the structures of oppression without insulting or demonizing those who were the oppressors. This was an important lesson for me as a Palestinian: to engage in activities that expose the injustice of the Israeli occupation without insulting a single human who belongs to the system of oppression. Gandhi took this one step further by also explaining that in creating such tension one should never lose vision and purpose. So often I find myself caught in the action where it becomes the means and the end, forgetting that there is a greater purpose to keep my eyes on. Gandhi was not a saint; he experienced daily struggles and challenges in his work and life. He probably made more mistakes than any other leader of his time, but he woke every day fully committed to ending violence and bringing about real peace and he knew that such transformation would not take place until he committed himself to being the change he wanted to see in the world. This is the greatest lesson I have learned as a Palestinian: to be the change that I want to see take place, not only in Palestine and Israel but in the world. I will be in Washington, D.C. participating in Global Voices of Nonviolence on Sept. 21. This event is hosted by Catholic University of America and EthnoGraphic Media. You can participate from anywhere in the world online through Beliefnet. To find out more about this event visit LittleTownOfBethlehem.org.